January 3, 2009 by rwb, under Microcontroller. Sometimes we need our microcontroller to interact with more human readable information. It will be better for us if we could make it display the words not just blinking the LED. Today most modern gadget such as mobile phone and PDA, use LCD (Liquid Crystal Display) for interacting with us. 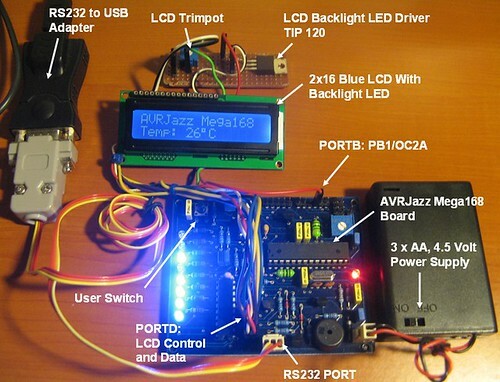 In this project we will learn how to use the 2×16 LCD for displaying the room’s temperature. Actually driving the LCD hardware directly is a complex task, but luckily we don’t have to do that; in the market they have already put it together in one package the LCD display hardware and the microcontroller that control it, so our task will be easier now as we only talk to the build in microcontroller inside. The most famous on the market is the 2×16 LCD with LED backlight using Hitachi HD44780U or the equivalent microcontroller, this 80 pins microcontroller is a special dot matrix LCD driver controller with low power consumption and able to use 4-bit data or 8-bit data interface; my suggestion is to have this HD44780U datasheet near you as we walk through this project. 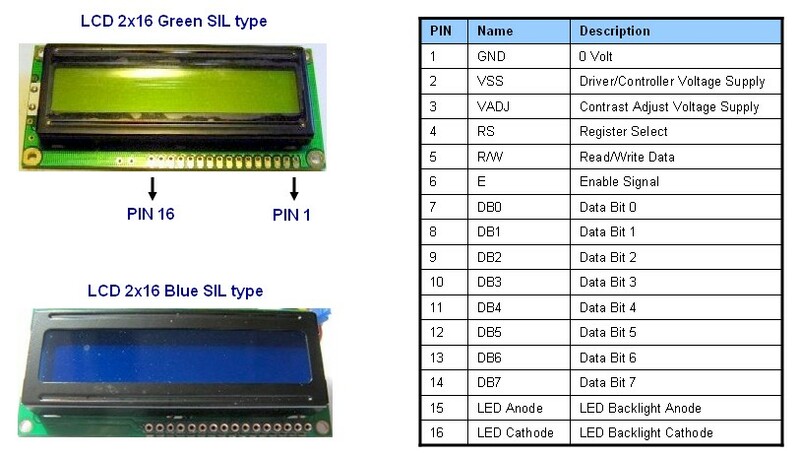 The simple 2×16 LCD with 16 pins connection is shown on the first schema, usually the VO pin for controlling the LCD contrast is connected to the trimpot that works as voltage divider, but because the board and LCD is using the same supply 4.5 volt and the voltage needed is very small (less then 0.25 volt) for readable/normal contrast you could connect it directly to the ground. The enhance version of this 2×16 LCD connection schema is shown on the right; on this schema we use the PWM signal to power the LCD backlight LED through the TIP 120 Darlington pair transistor but you could change this with other type of transistor that capable of handling more than 100mA needed by the LCD backlight LED such as BC639 or it’s equivalent. The reason of starting with PD2 instead of PD0 is to reserve the PD0 and PD1 for other usage, because the PD0 and PD1 port on AVR ATmega168 is the UART (Universal Asynchronous Receive Transmit) port that can be used to connect with other UART peripherals such as barcode reader or magnetic card reader. Make E fall down to zero so the LCD controller will read the data and wait for data stabilization; implemented in _delay_us(1) call function. Make E fall down to zero so the LCD controller will read the data and wait for instruction complete operation; implemented in _delay_ms(5) call function. This LCD initiation is implemented in the LCD_init() function, because during initiation we need to have 1 cycle of E (enable) data signal pulse, therefore the LCD_putcdm() used the second parameter (cmdtype) to differentiate it. After we finish the 4 bit data initiation, all the commands to the instruction register always use the 2 cycle of E (enable) data signal pulse. The ATmega168 is loaded with 6 PWM channels and for this project we will use the 8 bit Timer/Counter2 to generate PWM signal to power the LCD backlight LED through the TIP 120 Darlington pair transistor. The 8 bit Timer/Counter2 PWM have two interdependent PWM output the first one is OC2A (PB3, PIN 17) and the second one is OC2B (PD3, PIN 5); we will use the OC2A pin as the PWM output. The PWM initiation involve two registers in AVR ATmega168; the first one is TCCR2A (timer/counter control register A) to activate the waveform generator output OC2A to the port PB3 (COM2A1 and COM2A0 bits) and for selecting the PWM type (WGM21 and WGM20 bits); the second one is TCCR2B (timer/counter control register B) to select the prescaler frequency for the timer/counter (CS22, CS21and CS20 bits) and for selecting the PWM type (WGM22 bit). From the table above we will set the TCCR2A register with COM2A1=1 and COM2A0=0 for Clear OC2A on Compare Match; WGM1=1 and WGM0=0 for fast PWM mode. The OCR2A register is used by the waveform generator inside the ATmega168 PWM peripheral as the comparison value to the TCNT2 timer/counter register, so every time the TCNT2 register value equal to OCR2A register value (or reach maximum 255) then the OC2A output will be logical “0” otherwise the OC2A output will be logical “1“. By initialized this OCR2A register to “0” means the OC2A output will always on the logical “0” state, which turn off the TIP 120 Darlington pair transistor and the LCD backlight LED. Changing the OCR2A value from 0 to 255 (maximum) will vary the PWM duty cycle from 0% to 100% and vice versa; this technique is used to make the LCD backlight LED slowly turn on from dark to bright when we press the AVRJazz Mega168 user switch (connecting to the PB0 of PORTB) and again slowly turn off from bright to dark when we press the button again. This heavy loaded peripheral 8-bit 28 pins microcontroller is also equipped with 6 10-bit ADC channels (PDIP package; 8 channels on TQFP package) and has a build in temperature sensor too. This temperature sensor can be access by selecting the ADC8 channel and reading the value from this channel using the 1.1 volt internal voltage references. But on this project we will not use this build in temperature sensor instead we will use the AVRJazz Mega168 board temperature sensor which used the LM35DZ precession centigrade temperature sensor from national semiconductor. Because we are using the external reference voltage then we set the REFS1=0 and REFS0=0. The 10-bit ADC result will be placed in the ADCH and ADCL registers; the way this ADC peripheral put the result in these registers is depend on the ADLAR bit in ADMUX register when we set to logical “0” the highest 2 bits will be put in ADCH and the 8 lowest bits will be put in ADCL; when we set to logical “1” the highest 8 bits will be put in ADCH while the lowest 2 bit will be put in ADCL. In WinAVR C language, we can retrieve this 10 bit value form the special defined macro substitution ADCW which contain both ADCH and ADCL value; therefore we just set this ADALR bit to logical “0“. The successive approximation ADC method used in ATmega168 ADC peripheral required the input clock from 50 kHz to 200 kHz for maximum resolution; by choosing the 64 division factor we will get the frequency about 172.8 kHz (the AVRJazz Mega168 board crystal 11.0592 MHz divided by 64) . To power on the ADC circuit inside the ATmega168 microcontroller simply make the ADEN bit to logical “1“. 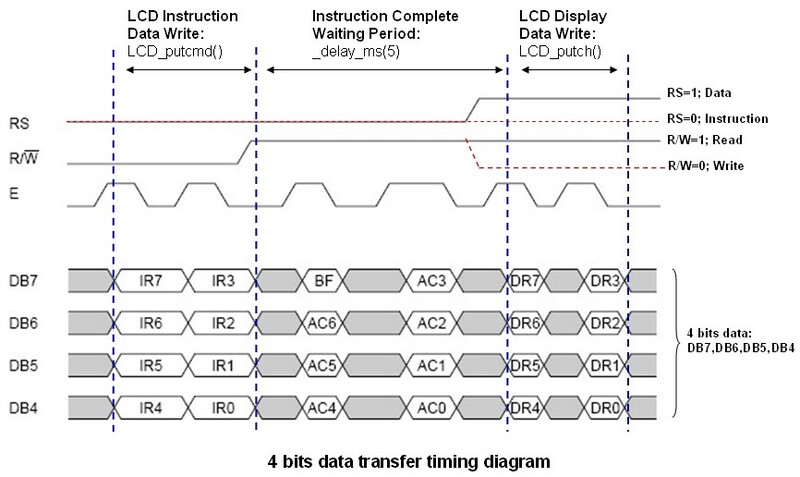 We just leave the ADATE, ADIF and ADIE bits to logical “0“, these bits is used when want to use the auto trigger ADC conversion (ADATE) or rising interrupt when ADC conversion complete (ADIF and ADIE). In this project we use free running mode, this mean every time we instruct to ADC peripheral to do the conversion by setting the ADSC bit in ADCSRA register to logical “1” it will start the conversion right away and when it finish the ADC peripheral will set the ADSC bit to logical “0“. We just leave the analog comparator multiplexer enable bit (ACME) to logical “0“. By disabling the digital input on the analog input channel, according to Atmel we could reduce the power consumption of the microcontroller, again we just follow the instruction by setting the ADC1D bit to logical “1“; we disable the digital input on this channel. 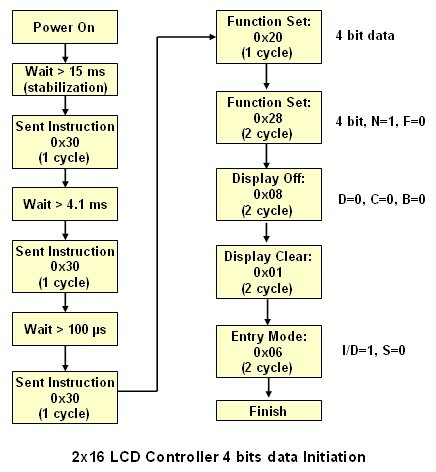 Inside this endless loop code we do 3 things; first we read the user switch status which work as a toggle switch to turn on and off the LCD backlight LED using PWM, secondly we start the ADC conversion and wait to complete by keep looping until the ADSC bit in ADCSRA register is set to logical “0” by the ADC peripheral. Finally we put the result to the LCD display. Excuse me Sir.. I just tried compiling this code and it does not compile. how do I file pic.h it is necessary for me to compile the code to hex? 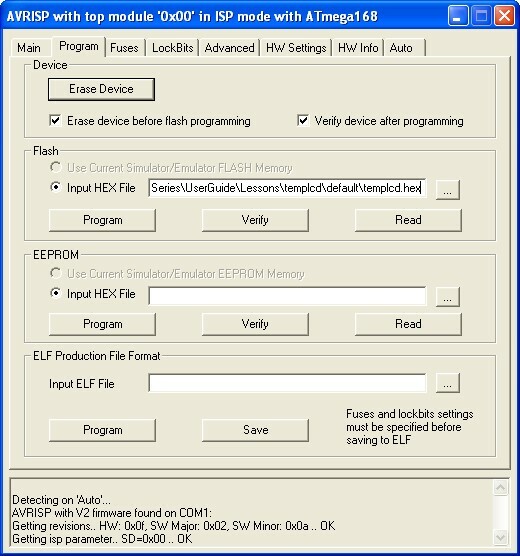 Did you mean the pic.h include file header on Microchip PIC microcontroller C program header? Because in this Atmel AVR project I didn’t use this file. 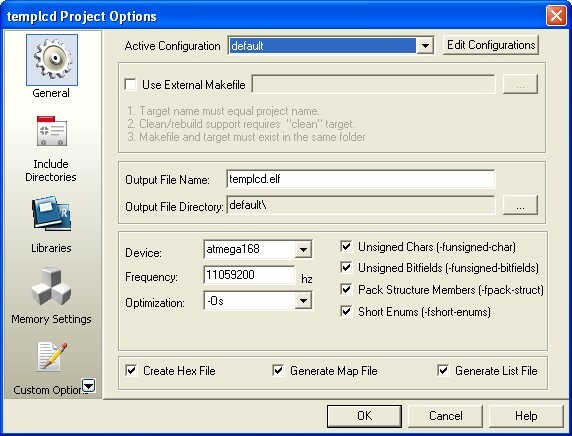 To use the pic.h include file you need to install the latest Microchip MPLAB IDE and the Microchip HITECH PICC Compiler and yes you need to compile it to the HEX file in order to run the code. In this project I used the external voltage reference 1 volts for the ADC (not internal Vref of 1.1 volt) provided by the AVRJazz Mega168 Board. You could read the explanation at “The ADC Peripheral Initiation” section on this project. Hmmm, the C code above does not set the REFSn, nor does the photo seem to show anything hooked to AREF? The demo code on the AVRjazz CD also does not set REFSn. 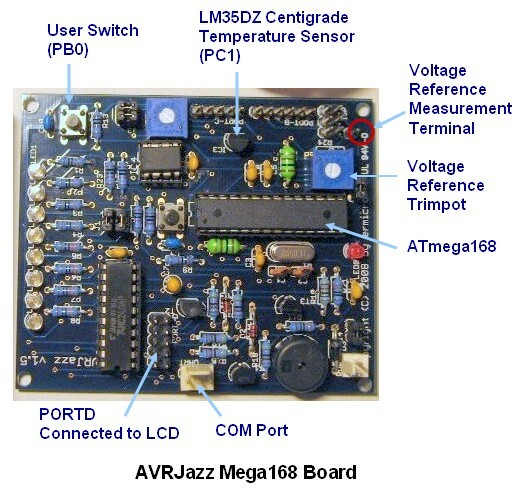 You should look at the AVRJazz board picture (or the schematic) carefully on “The ADC Peripheral Initiation” section, the 10K trimpot (forming the voltage divider circuit) is connected to the AVR ATMega168 AREF pin and provide the external Vref 1 volt to the AVR ADC peripheral. You could adjust and measure this external voltage on the “Voltage reference measurement terminal“. Thus you don’t need to supply or connect the external Vref to the AVRJazz board. 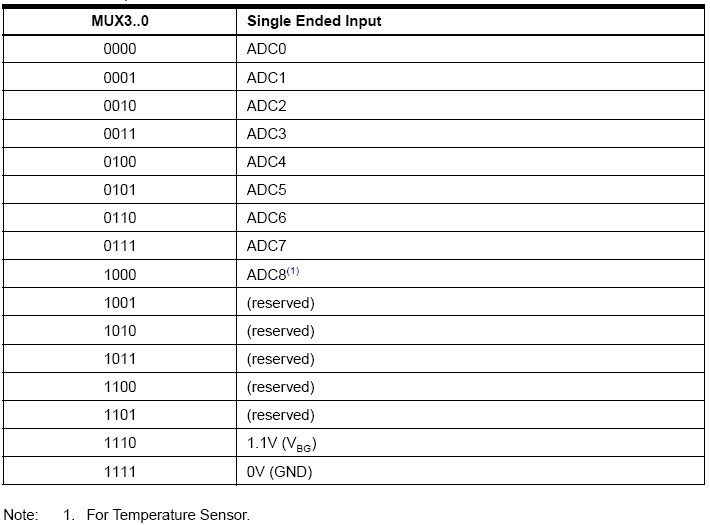 The above statement will automatically assigned both REFS1 (bit 7) and REFS0 (bit 6) on the ADMUX register to “0” and choose the ADC channel 0 (MUX3=0, MUX2=0, MUX1=0, and MUX0=1), which is connected to the LM35DZ temperature sensor (AVR ATMega168 PC1 pin). Ahh, I understand. I thought the trimpot would only affect an external voltage source attached to the AREF pin. Just curious. Given the availability of an internal 1.1v reference voltage, why would one prefer to use the trimpot and voltmeter to set an ADC voltage? Therefore the external Vref provided by AVRJazz Mega168 board give you a flexibility to experiment with various analog data sources (Vin).